This photo of the Fairhaven Village Militia loading the cannons at dusk on May 27, 2017, will be on the front cover of the 2018 Fairhaven Annual Report. Photo by Adam Katz. The Fairhaven Selectboard re­ceived 17 photos from seven people for the 2018 annual report cover. The board had trouble deciding on one at its meet­ing on 1/14/19, so they picked two, one for the front and one for the back. The names were not included in the copies that the board members saw so they would not be biased. Both pictures are from Fort Phoenix. 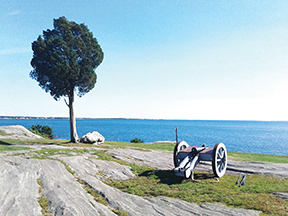 Assistant Town Administrator Vicki Paquette won the back cover, with her photo of the Fairhaven Villiage Militia’s small cannon near one of the few trees at Fort Phoenix, facing south towards the Atlantic. It was taken during the encamp­ment in September, 2018. Ms. Paquette said she got engaged by that tree on July 4, so it has a special meaning for her, and that’s why she took the picture. This photo of Fort Phoenix from September, 2018, will be on the back cover of the 2018 Town of Fairhaven Annual Report. Photo by Vicki Paquette. 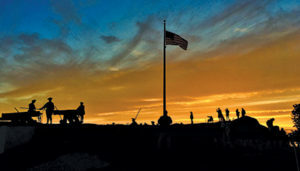 Adam Katz won the cover with his photo of FVM members silhouetted against a colorful setting sun, loading the cannons for the annual Memorial Day weekend firing in 2017. 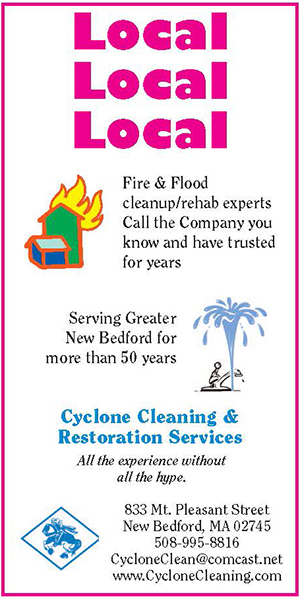 The annual report will be printed and available in time for Town Meet­ing on 5/4/19. It will also be available online on the town’s website.